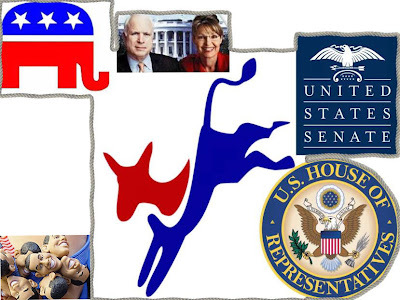 In a September 9th entry, 'McCain's hope,' this blogger pointed out that short of a game-changing event, Senator McCain's only hope was if the American public deliberately opted for divided government (given that the Democrats will increase their majorities in both houses). 'As expected' from September 21st noted that George Will had made this an explicit argument to vote for McCain. Now in 'John McCain's last chance' The Economist does the same -"... Second, Mr McCain should hammer away at the dangers of single-party rule in Washington, DC. The Democrats are likely to add at least another ten seats, and perhaps as many as 20, to their majority in the House. There is a real possibility that they may attain a 60-seat filibuster-proof majority in the Senate (Democrats are leading in eight Senate seats currently held by Republicans and are close in a couple of others; they control 51 of the 100 seats already). This will allow them to push through a wish-list of Democratic proposals on everything from “fair trade” to spending. The Republicans have only just started to point this out. But Americans have a strong preference for divided government. America has only had one-party rule (with the same party controlling the White House and both chambers) for six years out of the 28 since Ronald Reagan’s election in 1980—two years under Bill Clinton and four and a bit under George Bush. Mr McCain should argue forcefully that, as an experienced legislator who has worked with left-wing Democrats as well as right-wing Republicans, he will be the perfect man to check Congress where necessary and work with it where desirable ..."
Finally, Senator McCain has also taken up this argument, "... Republican presidential nominee John McCain , trailing in the polls, raised the prospect on Saturday of a complete Democratic takeover of Washington as a reason to elect him over Democrat Barack Obama in 10 days... McCain said having Democrats in control of the White House, the U.S. House of Representatives under Speaker Nancy Pelosi of California and the Senate under Majority Leader Harry Reid of Nevada, would give Democrats unfettered power ..."